Running repairs complete.. Para recon, and three late war British tows re-assembled and glued back on their bases. Not a lot of call for trucks in Spearhead as quite rightly one shouldn't really be seen dead in a truck in the FEBA (or alternatively if in a truck in the FEBA you are very likely to be seen dead). They were however in the box that was dropped and so needed to be repaired. 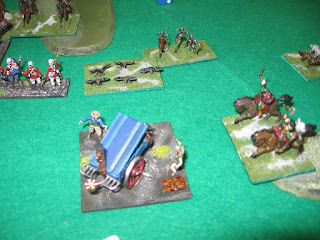 They might of course appear as AT gun tows? What's on the painting table? First, some repair work on some 20mm WW2 British transport and para recon for Spearher\ad. The box took a tumble during the shift back into the new house. Then, those Chaos bikes I bought 2nd hand.. supplemented with some extras cobbled together from the bits box, giving me 10 Chaos Space Marine bikes, all assembled, undercoated, and ready for painting. But here's a question: what does your painting table/desk/area look like? Mine is a little untidy/chaotic at the moment. Mind you, I guess it's actually usually like this, so perhaps this is my 'norm'. How about yours? Once these are done I think I'll shift back to the 6mm WW1 and WW2 armies again. There's nothing like painting at the extremes. What? Carruthers on the back foot? Gad Suh!! Nick and I had time for a third game, so for a change of pace we changed armies. 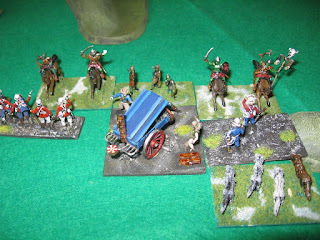 Caruthers stepped up to battle Nick's Rhaetian Goblins. A unit of British lancers supported by riflemen (shooters) moved out to protect the right flank against the goblin threat. And threat there was as goblins, bats and riders stormed forward. 'Oo look, they have a cave troll' .. well a troll, anyway!!! Machine loses out to troll flesh .. now that's awkward!!! And a mighty battle ensures on the right flank. But, his energies exhausted, finally the gallant doctor falls to the Goblin hordes and the day is lost. This must be one of THE most enigmatic HotT games I have ever played. The battle was hotly contested, the initiative shifting from one side to the other on numerous occasions. This is exactly why I 'game.. such excitement, such tension, and a damned fine game all round. Thanks Nick, you've re-energised me as a 'gamer. Despite the initial loss of control the battle for the underworld is not over. Still it rages as skeleton armies are raised and lost. Gazarog will not be denied, calling forth the skeletal remains of yet more armies long dead in his efforts to gain the power and control that he so desperately seeks. 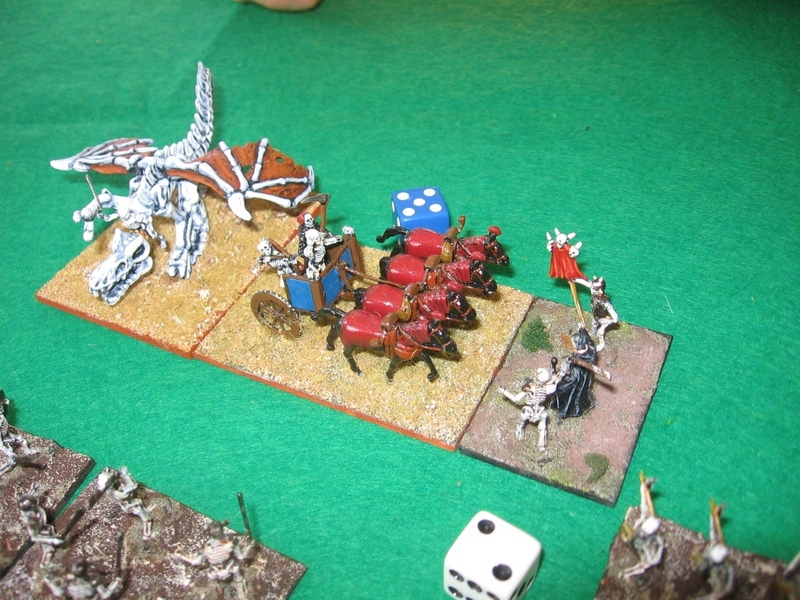 Gazarog's opponent raced his riders across his front in an attempt to wrong-foot Gazarog by shifting the focus of the action from one flank to the other. As they raced across the front between the two armies the powers of magic coursed through the fetid air ..
... and a unit of riders crumbled to the ground in a cloud of dust. Gazarog continued to advance his main line against the enemy. 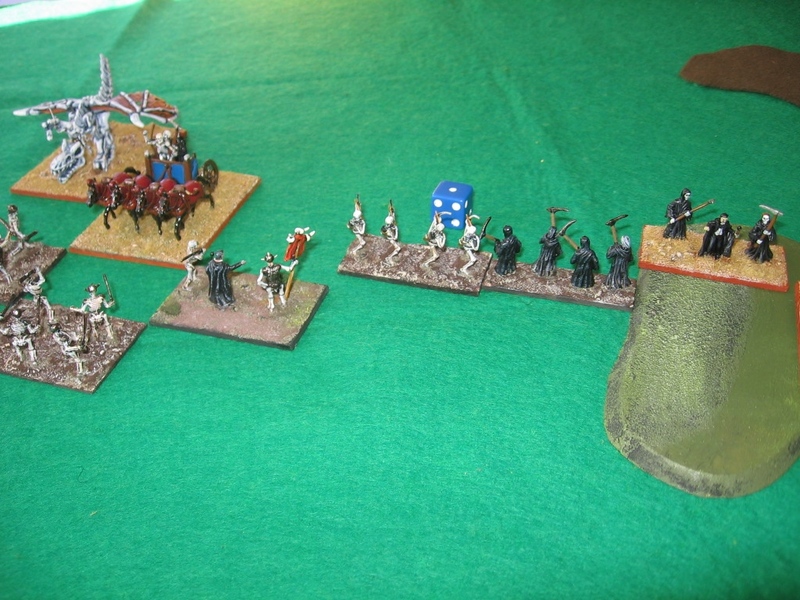 Undead archers supported Gazarog himself, cutting a gaping hole in the enemy line. Then Gazarog himself charged headlong into the enemy line, turning an enemy knight onto the flank of the enemy arial hero. His initial charge was repulsed. 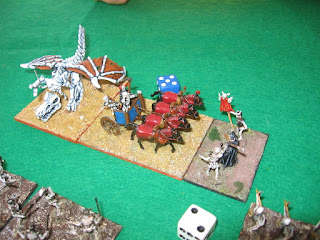 And so Gazarog summoned his skeletal archers to his support. And the enemy army was defeated, its troops crumbling to dust across the battle field. Gazarog knew however that this would not be the end. He would fight into eternity to hold the power that he had sought.